Are there excessive velocities or mach numbers at any point in the flare headers or laterals? Are there other concerns, such as noise, associated with flaring? Do backpressures at PSVs exceed the maximum allowable back pressure (MABP)? These questions, and others, can be answered using an application for analyzing flare system modifications; Aspen’s Flare System Analyzer (Flarenet) and Invensys’ Visual Flow are two such applications. Because our experience has been primarily with Flarenet, this discussion focuses on Flarenet; however, the conclusions apply to both applications. Excessive backpressure at a pressure relief valve may affect the performance of that valve, potentially resulting in instability and/or significantly reduced flow capacity, jeopardizing the safety of the equipment which the valve is meant to protect. 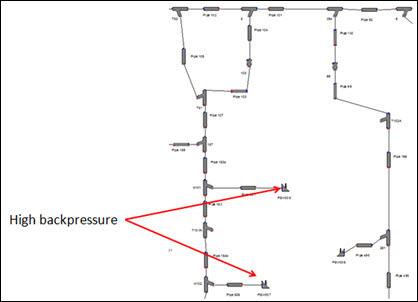 The following discussion addresses how excessive backpressure can be addressed using Flarenet. It may be possible to resolve backpressure issues by replacing existing conventional valves with balanced or pilot valves, which allow significantly higher backpressure. Flarenet allows the user to define the PSV type and maximum allowable backpressure (10% is the default MABP for conventional valves). 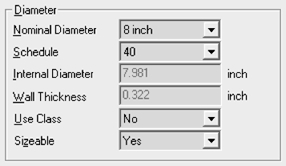 The following figure is a dropdown from Flarenet which illustrates the selection of the valve type. Flarenet can report which PSVs are exceeding the allowable back pressure depending on the valve type and associated MABP. This is particularly useful when the flare system is very large and there are many PSVs in the model. 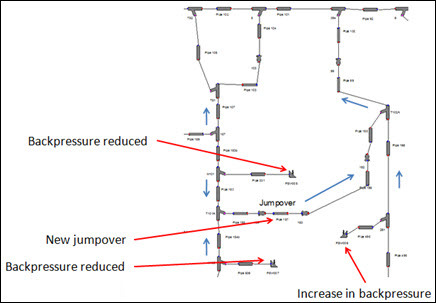 Jumpovers can be used to relieve local backpressure; the following figure shows a portion of a flare system where two PSVs have high backpressure, before the installation of a jumpover. When a jumpover is added as shown in the next figure, the backpressure is reduced in these two PSVs, since the flowrate in the lateral is reduced by diverting some of the flow to another lateral. This reduction in flow results in a lower pressure drop and ultimately lower backpressures at these PSVs. However, in the lateral to which flow has been diverted we would see an increase in backpressure, and therefore we should ensure that we are not introducing problems in other parts of the flare system. Flarenet can be used to model the effects of jumpovers, and flag where there may be issues. For existing flare systems, if a flare header or lateral is too small there could be the option to replace those pipes, or run a parallel flare line. Specification of the line sizes is done via the Pipe view (a portion of which is shown below). After making the change, the case can be re-run to determine the impact on pressure drops and ultimately back pressures at the relief valves. Additional parallel headers could also be added, and Flarenet would calculate the impact of relief flow being directed to both headers, along with the resulting reduction in pressure drop. For large flare systems, there may be the option to move a particular relief load to a different part of the flare system, or if there are multiple flares, moving that load to a different flare header. Flarenet has the powerful capability of allowing the user to run multiple scenarios for a particular flare system “topology”. That is, changes in relief loads and conditions can be stored in specific scenarios which can then be run individually or in combination. Differences in line sizes or structure (such as the presence of a jumpover) cannot be stored in the scenario, so the user needs to either keep separate cases for these instances, or track the changes in a separate spreadsheet as a reminder to manually make the change in the Flarenet model when that case is run. The following figure illustrates a simple example of this – in case 3, the user needs to ensure that the header size is 10”, and that the jumpover pipes are “ignored” in Flarenet before running the scenario. The following table illustrates typical results for this type of backpressure analysis. The backpressures for PSV #1, PSV #2, and PSV #3 can be reduced by incorporating the jumpover proposed in Case #3, while not significantly increasing the backpressures at other valves. At the same time, changing these valves from conventional to balanced will help to resolve the excessive backpressures at those valves. Flare analysis tools such as Flarenet are effective for analyzing flare system modifications. Betters decisions can be made quicker using a flare analysis tool – representing potentially hundreds of hours over the course of supporting flare operations.